Vermont Finders Keepers — a venture that is part art, part scavenger hunt — is the brainchild of Morrisville resident Keith Mailhotte, 47. In his home workshop, which is more boot room than atelier, he turns ordinary eggs into intricate art objects. 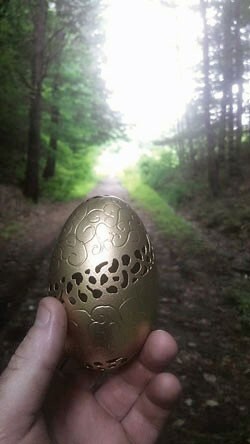 But that’s not all; Mailhotte hides the sculpted eggs around Vermont and posts clues to their whereabouts on his Facebook page. Anyone who finds an egg is allowed to keep it. Mailhotte, who works at Butternut Mountain Farm in Morrisville, launched Vermont Finders Keepers last September. He says the hunt idea came to him at Easter time, when all those kids were out sleuthing for treasures. His expertise in creating lacy designs on eggshells, however, has been developing since he first bought a ParaGrave tool about 15 years ago. Invented by a dentist, the cutting and engraving device enables Mailhotte to “draw” on and into hollowed-out chicken, goose, emu and ostrich eggs that he buys online. Because of the fine particulate dust the ParaGrave generates, Mailhotte has built a transparent box around the tool and equipped it with a magnifying glass. During a recent visit to his studio, he demonstrates by slipping his arms into the two arm sockets and operating the instrument inside the box, holding it like a pen as he traces pre-penciled designs on a goose egg. Powered by an air compressor, the ParaGrave emits a high-pitched whine, unnervingly reminiscent of a dentist’s drill, as the bit spins at 300,000 rpm. Even with the containment system, the room begins to smell burnt and peppery. After he achieves the design he wants, Mailhotte brushes the dust from the egg; sometimes he covers it with colorful spray paint. From start to finish, creating each illustrated egg takes one to two hours. Mailhotte began hiding his eggshell creations and posting clues for finders in September 2012. Since then, he’s been stashing as many as five eggs a week in every county in Vermont except Bennington and Windham. Some of his eggs have been found near the Fisher Covered Railroad Bridge in Wolcott, on top of Mt. Elmore and along the Stowe Recreation Path. He’s discovered that egg hunters will go out in just about any weather condition — even at 10 below zero — and drive upward of 100 miles to find a prize egg. At his day job, Mailhotte makes maple sugar for Butternut, one of Vermont’s biggest syrup and sugar distributors. Despite his obvious egg-sculpting skills, he insists he doesn’t know anything about art. “For instance, I see a Jackson Pollock and think, Are you kidding me?” he says. But he hopes his finders are proud to own his creations. “I don’t know if they’re going to be worth anything in the future,” he adds. Now that this modern-day Fabergé has reached his one-year mark of egg laying, his Facebook page is filled with smiling people holding artful eggs. Mailhotte estimates his followers have found and kept about 250 eggs in total. To celebrate, he’s devised a homecoming for the keepers of the prodigal ova. On September 13, the Art House in Craftsbury Common will host an evening exhibition and reception for the victorious finders, at which the losers-weepers and the curious are also welcome. Many of the finders’ eggs will remain on display at the Art House over the weekend. What pleases Mailhotte most, he says, is that he can give his followers an experience and not just an ordinary commercial transaction. Instead of buying the eggs at a store, finders acquire a story, a memory of the hunt. “You have to participate,” he explains. Attendees of Saturday’s gathering should expect an eggs-travaganza of beautiful keepers and the stories behind the searches. The original print version of this article was headlined "Eggs-perienced Seekers Find Artful Sculptures Around Vermont."